The “Southern Avenger” may sound like a comic book character, but he is no superhero fighting for truth, justice and the American way. In fact, the man who calls himself the Southern Avenger is Jack Hunter, a close aide to U.S. Sen. Rand Paul and for years a pro-secessionist, mask-wearing radio pundit and neo-Confederate activist, The Washington Free Beacon reported today. Hunter co-wrote Paul’s 2011 book, The Tea Party Goes to Washington, and joined the Kentucky Republican’s Senate staff in 2012 as social media director. But from 1999 to 2012, the 39-year-old writer was a South Carolina radio shock jock who “weighed in on issues such as racial pride and Hispanic immigration, and stated his support for the assassination of President Abraham Lincoln,” according to the Free Beacon, a conservative online publication of the Center for American Freedom. Hunter apparently didn’t wear his heart just on his sleeve. He wore it on his face. 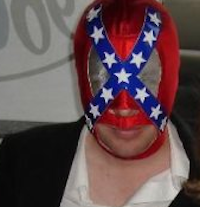 During his radio days, Hunter often pulled on a mask resembling a Confederate flag at public appearances, giving him the look of a third tier professional wrestler, the guy who always gets body-slammed and then thrown out of the ring. It’s unclear whether Hunter wears his mask while writing. Whatever his method, though, he has been prolific. He has produced dozens of articles and video commentaries for the conservative online Daily Caller and appeared as what one Fox Business host termed a “regular” guest on that network, according to Media Matters For America. In addition, Media Matters reported that Hunter also helped former U.S. Sen. Jim DeMint of South Carolina, now president of the Heritage Foundation, write his most recent book. Neither Paul nor Hunter was available for comment Tuesday, Paul’s office said, referring media inquiries to Paul’s spokeswoman, Moira Bagley, who did not respond to an interview request from Hatewatch. Hunter has also worked for Paul’s father, Ron Paul, the former Republican congressman from Texas. Hunter was the official blogger for the elder Paul’s 2012 presidential campaign, according to Charleston City Paper. Four years earlier, the elder Paul got into considerable hot water when The New Republic published “Angry White Man,” an article about the contents of newsletters he published. What the newsletters revealed, The New Republic reported, “are decades worth of obsession with conspiracies, sympathy for the right-wing militia movement, and deeply held bigotry against blacks, Jews and gays.” Ron Paul denied writing the newsletters that bore his name. Speaking of angry white men, the Free Beacon said that prior to his radio career, while in his 20s, Hunter was a chairman in the League of the South, labeled a neo-Confederate hate group by the Southern Poverty Law Center. Hunter told the Free Beacon, however, that he no longer holds many of his former views. As he settled into his job with Rand Paul, Hunter wrote a farewell column in April in the Charleston City Paper, for which he had been writing a weekly column since 2007. He said the Southern Avenger was a character and that his radio audience “seemed to enjoy my superhero-meets-redneck persona.